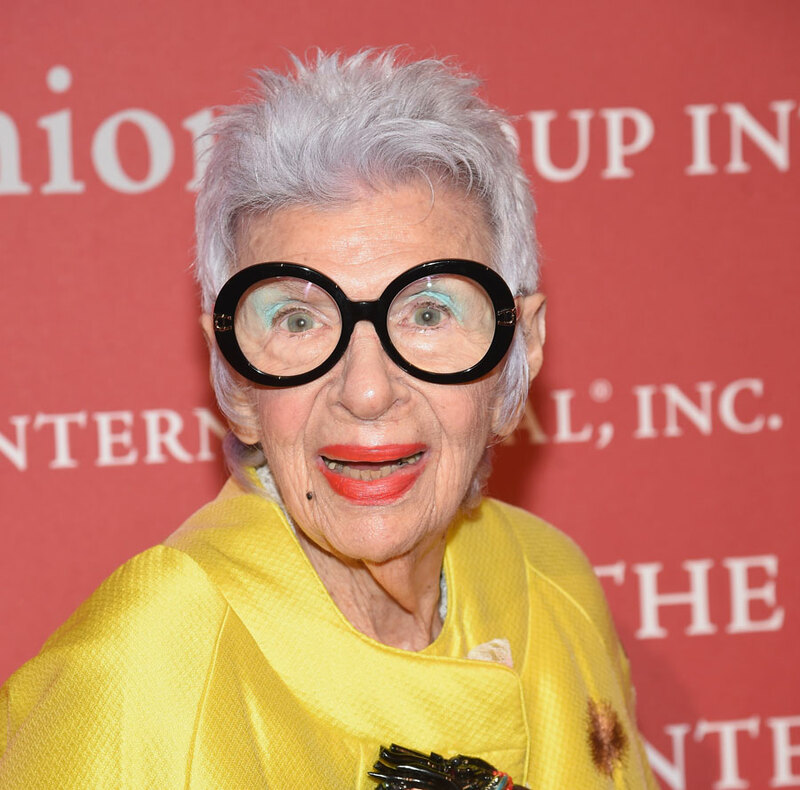 When IMG, one of the biggest modelling agencies in the world, announced last week they added 97-year-old style icon Iris Apfel to their roster of models, the news startled most people in the fashion industry. But not because a nonagenarian has joined a modelling agency. Or certainly not due to the fact the New Yorker will be joining the ranks with such supermodels as Kate Moss and Gisele Bundchen, who are also repped by this global powerhouse. Rather, the astonishment was due in light of the fact Apfel had somehow swanned through the last decade without a modelling agent. After all, Apfel has in the past few years, starred or collaborated in a lengthy list of campaigns – from cars to vodka to makeup. She has been featured in ads for Kate Spade, MAC cosmetics, Alexis Bitter and Parisian department store Le Bon Marche. She posed for Italian Vogue and was on the cover of Hipster magazine and Dazed and Confused. And she’s not just a pretty face. She has a clothing and accessories line sold on the Home Shopping Network. 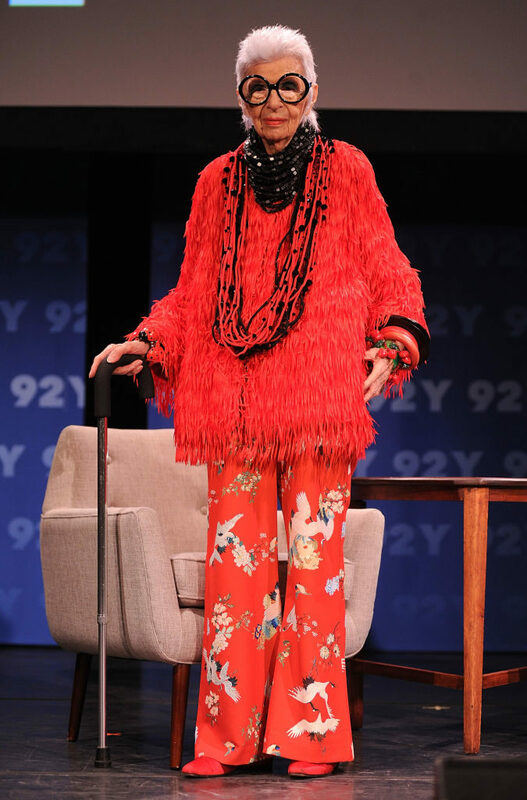 Last year she wrote a book, Iris Apfel: Accidental Icon and was the subject of an award-winning documentary, Iris, in 2014. So, it was rather astonishing to some that Apfel had accumulated such fashion gigs without the help of an agent. As she told WWD, the fashion trade newspaper, people would just call her up and she handled all the negotiations herself. “I’m a do-it-yourself girl. I never expected my life would take this turn so I never prepared for it. It all just happened so suddenly, and I thought at my tender age, I’m not going to set up offices and get involved with all kinds of things. I thought it was a flash in the pan, and it’s not going to last,” she said in the WWD interview. But it was her good friend, the designer, Tommy Hilfiger, who convinced her to get a model agent and put her in touch with IMG. “I’m very excited. I never had a proper agent,” said Apfel. She and her husband started a textile company in the 1950s called Old World Weavers, which lead to design restoration projects at the White House, under nine different administrations, from Truman to Clinton. Apfel, a bon vivant, became known for an extraordinary sense of style which resolutely involves a cacophony of colour, oversized bold jewelry with a pile-it-all-on mentality, punctuated with her trademark large round glasses. This eccentric fashion sense has lead to an exhibition of her fashion legacy in 2005 at New York’s Metropolitan Museum of Art. 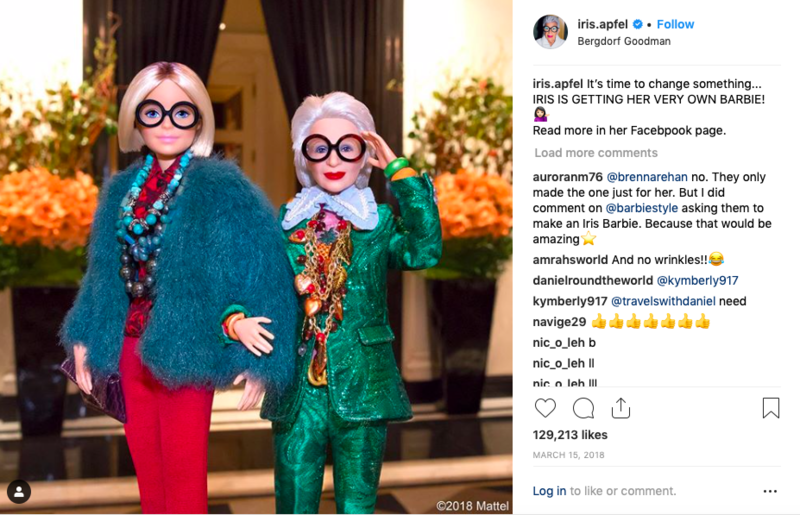 The Iris Apfel Barbie Doll, right, with Barbie styled by the fashion icon. Last year, Mattel issued a Barbie in her likeness, making her the oldest person to be turned into the famous doll.